Bracelet - Three strand. 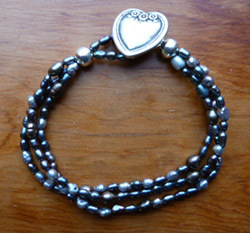 Freshwater pearls, silver plate over stainless steel beads, and pewter heart button clasp. Length approximately 7 & 3/4 inches. There is a secret one inside. All the stars and all the galaxies run through her hands like beads.